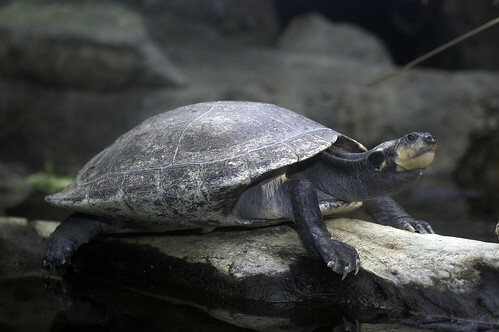 One of the largest South American river turtles, this species can be recognized by its dark upper shell and the yellow spots that adorn its head, though these fade with age. Females can be twice as large as males. 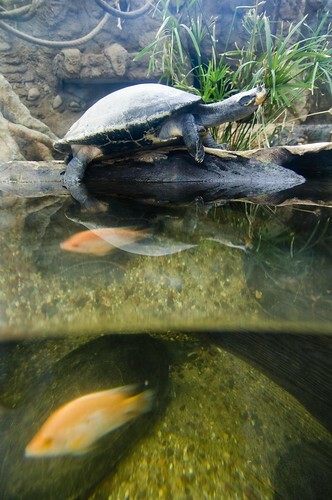 As their name implies, these turtles inhabit South America's Amazon River. 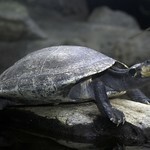 The yellow-spotted Amazon river turtle is listed as vulnerable. They occupy tributaries and lakes connected to the Amazon River, though when the river floods, they will branch out to flooded forests. 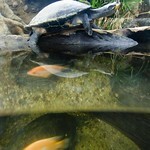 These turtles eat a range of foods, from fruit and plant materials to fish and small invertebrates. Females lay two clutches each year, each with as many as three dozen eggs, which are deposited in nests dug into sandy riverbanks. Hatchlings take to the river just like their parents. These turtles can live 70 years.